They love his versatility, his toughness, and his upside. 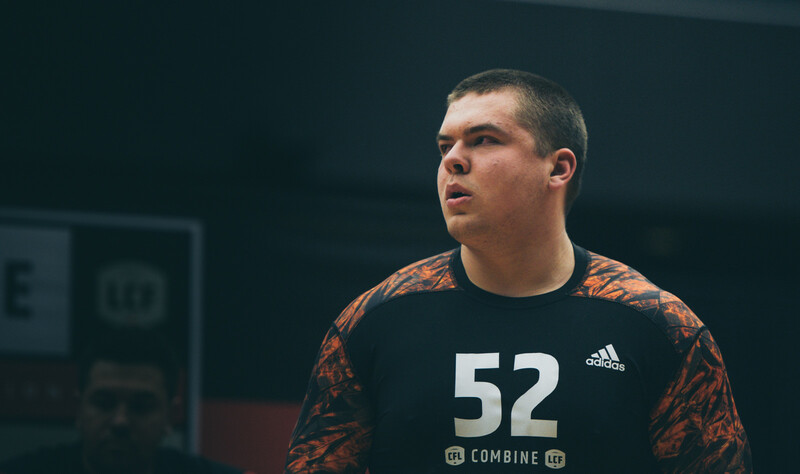 And the bonus for the Winnipeg Blue Bombers in selecting Simon Fraser University offensive lineman Michael Couture 10th overall in Tuesday’s Canadian Football League Draft? He’s got some ties to the Manitoba capital that could crank up business at the ticket wicket. “Both my mother and father, my whole family, is (originally) from Winnipeg,” said Couture during a media conference call this week. “I have aunts, uncles, cousins that all live there right now. ‘Goose’ would be Bombers’ centre, Matthias Goossen, a future teammate here and a past teammate with the Clansmen. The two were together at his dad’s home in Vancouver, along with an assortment of others, when Couture’s name was called out by the Bombers Tuesday. “I kinda had a feeling that Winnipeg liked me throughout the combine and the whole draft process,” Couture said. “I was really happy where I went and I couldn’t be happier to get drafted by the Blue Bombers. “(The draft) was pretty nerve-wracking. It started at 4 (p.m.) Pacific time and I had teammates, high school friends, aunts, uncles, my family, everybody in and right around 3:30 I couldn’t take a seat. I was pacing in front of the TV and had my cell phone in my hand. Couture brings a great deal of versatility to a Bombers O-line that could use that and some more depth. In addition to Couture’s ex-SFU teammate Goossen, there is second-year man Sukh Chungh along with veterans Patrick Neufeld and Jeff Keeping, as well as fellow draft pick Zach Intzandt of McMaster (fifth round, 37th overall). Couture made 37 starts during his college days, beginning at left guard as a freshman but also taking snaps at both right and left tackle and at centre. Interestingly, Couture hasn’t played three-down football – with the yard off the ball at the line of scrimmage – since his days playing community football. SFU is in the NAIA, an American conference, while the B.C.’s High Schools Football Association is the only province that uses four-down rules. All that said, Couture adjusted quickly at the CFL’s Draft Combine in March and was solid in the one-on-ones with defensive linemen who participated. Couture has modest goals for 2016: make the team, learn the intricacies of the trenches from one of the best O-line coaches around in Bob Wylie and – fingers crossed – see some action.